Everything You Need To Know About Lucifer Season 4 That's Coming To Netflix! It was a long wait till Lucifer graced our screen with his presence, but finally the details have emerged for the fourth season of Lucifer. 'Lucifer' fans were utterly ecstatic this week when the release date of the fourth season was finally announced. The new images of the devilish show have been released, showing off an upcoming romance, reported Radio Times. The release date of all the ten episodes has been disclosed after speculating the details of the upcoming season for months. Now viewers will only have to wait a few weeks to see the return of the Lord of Hell, Lucifer. The brand new images of season four were recently released by Netflix and show off the arrival of Eve in Lucifer's life. The supernatural-tinged procedural will release its new batch of 10 episodes on Wednesday, May 8, 2019. It is also said that the runtime of the 10 episodes will upto 666 hours. A devilish teaser video was recently released which revealed the date and time of the new episodes. Season 4 on Netflix will encompass what was to be the first half of its originally conceived broadcast run. Ildy Modrovich, co-showrunner said, "We were going to have two parts to it anyway, so we’ll just tell a really strong, gnarly first part. Let us concentrate the story and focus it, and that’s what’s really exciting about this. We have a really strong first half that is now going to make for an amazing story.” As the audience had to wait for several months for season four's arrival, it has been theorized that Eve will be returning to claim her former flame’s attention. The character synopsis of Eve also indicated that she has some trouble in store for the ruler of the underworld. 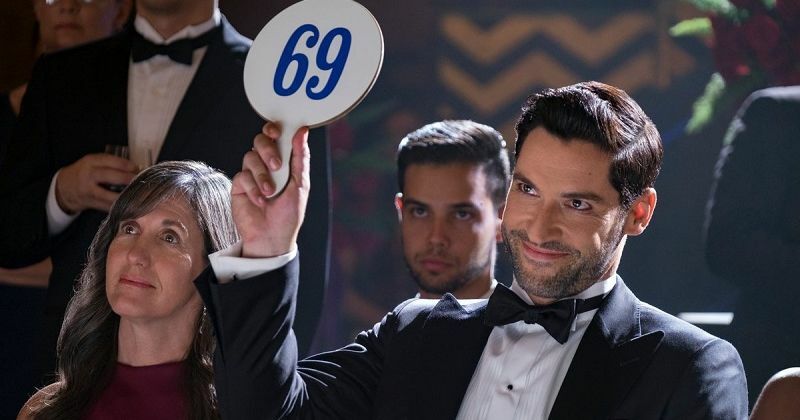 But, another image has also shown Lucifer in high spirits as he raises smirks whilst holding up an auction paddle which cheekily has the number “69". Even though Chloe Decker was expected to be the main attraction of season 4, as season three closed out with her seeing Lucifer’s devil face for the first time. But in one of the new images, Chloe can be seen smiling at the demon whilst looking over what could be a new murder case. Lucifer season 4 will air on Netflix on May 8, 2019. The news was revealed in a smoking-hot new teaser trailer featuring star the devil himself, Tom Ellis emerging from a swimming pool and picking up a glass of something strong. Did you notice the sign 666 on his lower torso, don't miss it! This date also signifies that the show will return almost exactly a year on from the day the series was first canceled. Prior to coming to Netflix, 'Lucifer' previously aired on Fox in the United States and was later released on Amazon Prime Video in the UK. After the show was revived by Netflix, it will now air at the same time internationally, meaning British viewers will no longer have to wait for new episodes. 2. Will Netflix have Lucifer seasons 1-3? The previous three seasons will move on to Netflix and all the three seasons will also be available on Netflix. 3. Is The Trailer For Season 4 For 'Lucifer' Available? Even though a full trailer is not available as of now, Netflix has released a teaser trailer featuring three of its key stars, Tom Ellis, Lauren German and Inbar Lavi, and let’s just say they know what their fans want. The 90-second-long footage promises a smoking-hot scene between the trio before Tom Ellis shows some skin while teasing the new episodes.